It’s here — the snow has not stopped falling since last night for many of us living on the East Coast. It was supposed to start this afternoon. As we hunker down for the impending blizzard, it’s important to make sure our dogs and cats are safe and warm, too. According to Weather.com, people in the Northeast are to get more than 2 feet of snow and blizzard conditions when Winter Storm Juno hits today. The storm is expected to last until Wednesday, but it’s not too early to prepare. Governor Chris Christie, for instance, is urging New Jersey residents to stay home, and similar measures are advised in New York and other states. Obviously, these conditions that impact humans can have more far reaching effects on pets. 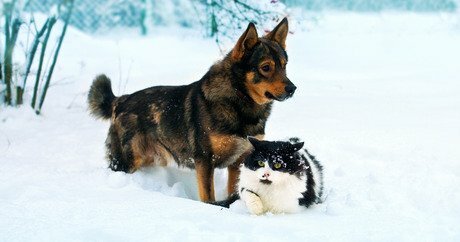 Keep your pets indoors as much as possible during winter months, but this is especially true with the impending storm — please bring them inside immediately, and limit their time outside for brief bathroom trips through the duration of the storm. When they do go out, make sure they’re prepared: depending on their breed, coat thickness and size — they may need a coat. If they have sensitive paws, make sure they’re wearing their booties. Always walk them with their leash, collar, and ID tag in case the unthinkable happens. Once you’ve brought them back inside after doing their business, clean them off. Make sure to towel dry your pet right away, paying special attention to their paws, paw pads, and the spaces between their toes. Winter walks can turn dangerous quickly if chemicals from ice-melting agents are licked off legs and paws. Be sure to secure winter-weather products like anti-freeze and ice melts and keep them out of your pet’s reach. If you see a pet in distress, report it. If you’re in NYC and you see an animal without adequate shelter, food, or water, please call 311. If you see animal cruelty in progress, call 911. Those outside of NYC should contact their local law enforcement or animal control, depending on the municipality. Take a look at additional resources and tips to protect your pets from hazardous weather conditions on DogTime.com.